Damn Canada, you look beautiful lit up. If you've been lucky enough to catch Canada's gorgeous northern lights, which can range from purple to green to pink, you know how stunning they are in real life. These "dancing lights" are caused by collisions between particles in the Earth's atmosphere and ones in the sun, the Northern Lights Centre notes. "Variations in colour are due to the type of gas particles that are colliding. The most common auroral colour, a pale yellowish-green, is produced by oxygen molecules located about 60 miles above the earth," the centre adds. And while they are more common in northern territories like Yukon and Nunavut, and northern parts of provinces like Quebec and Manitoba, as you will notice in the images below, they can be visible in many Canadian cities. And if you just need something soothing and meditative, check out the video above with a full time lapse of the northern lights in Churchill, Man. Here are 32 amazing images of the northern lights from coast to coast. Aurora Borealis above the Cassiar Mountains. Camping under the northern lights in Muskwa Kechika Wilderness. Northern lights over a tent in the Yukon Territories. Band or arc of Aurora Borealis in the winter sky in the Yukon Territories. Strong northern lights over downtown Whitehorse. Beautiful lights over a cabin in Northwest Territories. Fort Simpson in the Northwest Territories. Aurora Borealis glows in the night sky above the C-Dory expedition boat in the northern Hudson Bay. An array of northern lights in Arviat, Nunavut. Purple and green skies in Nunavut. Aurora Borealis caused by heavy geomagnetic storm in Vilna. An Aurora Borealis resulting from a major solar flare in Alberta in 2001. Star trails and northern lights over Peyto Lake in Banff National Park. Aurora Borealis over a lake in Saskatchewan. Northern lights over a field in Saskatchewan. The Aurora Borealis in Northern Manitoba. Northern lights above an igloo outside Churchill. Spectacular and brilliant Aurora brightening up the sky and beach near Parry Sound. 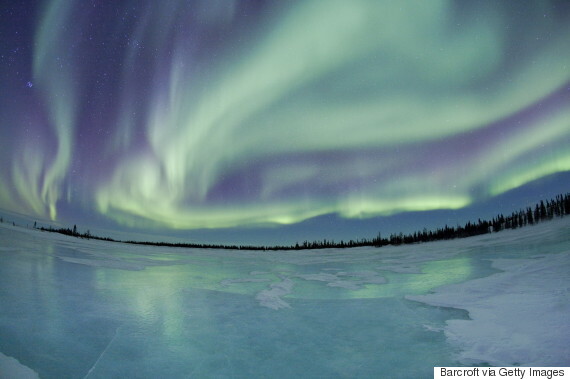 The Aurora Borealis seen at Charlie Lake in the Nunavik region of Northern Quebec. Aurora Borealis in Prince Edward Island. Faint northern lights glow over a still Nova Scotian lake. Northern lights near Mahone Bay. The northern lights shimmer in silence over a remote lake in Nova Scotia. Northern lights at Torngat Mountains National Park.